Hollow / The Pumpkin Sinister / Kcirt ro Taert / Strange Cargo / The Ballad of Jonathan Crane / Night Gods / Night of the Reaper! / The Origin of Swamp Thing! “Hollow” is a 12-page story written by Brian Azzarello (BATMAN: DAMNED, THE DARK KNIGHT III: THE MASTER RACE), with art by fan-favorite artist Greg Capullo (DARK NIGHTS: METAL, BATMAN: LAST KNIGHT ON EARTH). Children can’t help but be curious about what lurks in the woods at the edge of town on Halloween night…and unfortunately for them, this group of trick-or-treaters has crossed paths with a mysterious witch who has her own tale to tell about where curiosity leads—directly into the path of the creature known only as Swamp Thing! Can they escape her clutches? Or is there something much worse out there that they should REALLY fear? 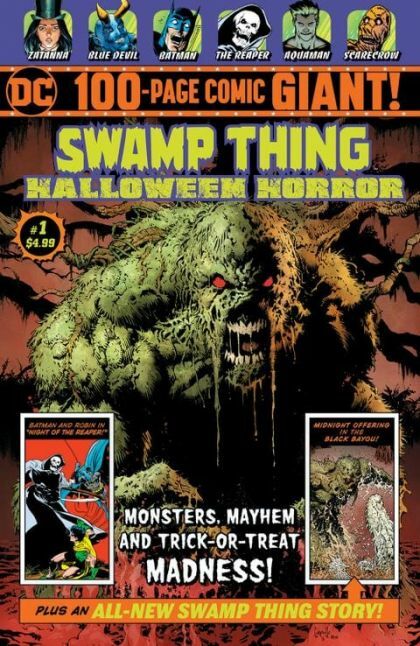 On Halloween, the barrier between worlds grows thin—and only the Swamp Thing is strong enough to face the monsters that come from the other side! An evil pumpkin monster wreaks havoc on All Hallows’ Eve! Powerful witch Zatanna must save Halloween when teens pump trick-or-treaters’ candy full of Scarecrow’s fear toxin. Superman has faced off against plenty of foes…but can the Man of Steel fight zombies? It’s the Scarecrow versus the Headless Horseman! Do Aquaman and Etrigan stand a chance against an undead underwater army? BATMAN and ROBIN in NIGHT OF THE REAPER! The Grim Reaper spares no one…including Batman and Robin! SWAMP THING in THE ORIGIN OF SWAMP THING! A young scientist is killed in a terrible explosion, he but returns to life as something entirely new…the Swamp Thing!